Want to show your college pride. 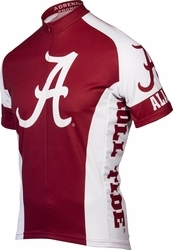 Ride with one of these great officially licensed NCAA College Cycling Jerseys by Adrenaline Promotions. These Jerseys are meticulously constructed from 100% treated micro fiber polyester for quick-drying, moisture transfer ensuring total riding comfort. Three rear cargo pockets provide easy storage and neck zippers allow adjustable ventilation. Whether you went to the Air Force Academy and rooted for the Falcons, or went to Yale and cheered on the Bulldogs, you will be able to find the right college biking shirt for you! The all over print and color makes your school pride hard to miss. The shirts are designed with 100% treated micro fiber polyester, which allows for moisture wicking, keeping you comfortable for any ride. Adding to its performance is a neck zipper, which allows for adjustable ventilation. The back the shirt has 3 pockets, providing you storage for anything you want to keep close by. If the shorter sleeved look is not your style, make sure to look for our long sleeved, college shirts! 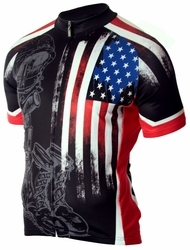 Bike jerseys are usually shipped in 1-5 business days.